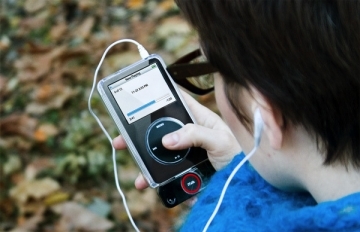 Griffin Technology has announced that its new iTalk Pro, an accessory that turns an iPod into a CD-quality audio recorder, is shipping. The iTalk Pro plugs directly into the iPod’s dock connector. One-touch operation is designed to let users concentrate on what they’re hearing, instead of how to operate the equipment. iTalk Pro can record in stereo or mono. Built-in twin microphones record in stereo at 44.1 kHz to yield “CD-quality” recordings. The iTalk Pro also features a stereo 1/8″ (3.5 mm) input jack to accommodate external microphones for greater stereo separation. Adjustable gain settings give the user control over the volume, making iTalk Pro the world’s most faithful, most portable handheld recording studio. The iTalk pro is priced at $49.99 and is now available. iPods with video and iPod nano 2G.